Babies come with boundless joy and precious moments, but parenthood also comes with some major decisions and worries: Are they getting enough tummy time? Is formula okay, or should I breast feed exclusively? How do I know if a day care is safe and high quality? Should everything that touches my baby be organic? In the always connected age of technology, new parents are constantly bombarded with articles and posts about what they should and shouldn’t do. Those articles often serve up conflicting views, each with their own set of statistics to prove just how correct they are. It’s easy to feel overwhelmed or worry you are going to harm your baby if you don’t make the right choices. Take a deep breath. By researching things like the benefits of organic cotton for babies or the benefits of organic baby formula, you are already doing your part to ensure you make the best decision for your baby. Check out these benefits of organic baby products to determine if you should make the switch. Breastfeeding versus bottle feeding. Stay-at-home parent versus day care. Attachment parenting versus Babywise parenting. Organic versus conventional — Parenting comes with many debates that often inspire passionate pro and con positions. When you have a young baby, you convince yourself these decisions are going to make or break your child’s entire existence. The truth is, however, babies on both sides of every debate go on to lead normal, healthy lives. Deciding whether or not to shell out more money for organic is often a dilemma for parents. Add GMOs to the mix, and you really start to see the debate heat up. On one side, you have the pro-conventional group who asserts that organic products are no healthier than conventional products. They say the pesticides and other chemicals used in conventional processes don’t pose any health or safety risks. This group often points to the higher cost of organic products, which they believe are not worth it. The pro-conventional group has quotes, studies and statistics to back up their claims. On the pro-organic side of the debate, you have people who raise concerns about the chemicals often used in conventional products. This group points out negative effects on both a personal, family level and on a greater scale in terms of the environmental impact of using those chemicals. They point out that the cost difference for many organic products is minimal, and the investment is worth the health benefits. The pro-organic group also shows up to the debate armed with quotes, studies and statistics to support their positions. Other people fall somewhere in the middle, wanting to lead an organic life but wondering if the investment is worth it. No matter where you fall on the spectrum, understanding the benefits of organic baby products helps you make the best decision for your family, despite what other parents might say. Do Babies Need Organic Clothes? As a parent, you know just how many onesies a baby can go through in an average day. Between the spit-up incidents and leaky diapers, a lot of different fabric touches your baby’s skin every day. But does it really matter if the clothing is organic? Is organic clothing better for babies, and what exactly makes clothing organic? Organic clothing is made of natural materials produced with organic processes. Only natural fibers qualify as organic clothing. This includes cotton, wool and flannel. Organic clothing generally shouldn’t have chemicals or synthetic products in any part of the processing, from the growing process to the manufacturing process. Eliminates chemicals that sit right next to your baby’s skin. A baby’s skin is much more delicate than yours. It is thinner and more porous, which means it easily absorbs things it comes into contact with. Since clothing directly touches your baby’s skin all day and night, it makes sense to minimize or eliminate chemicals in those materials. By choosing organic clothes, you reduce the amount of chemicals that absorb into your baby’s body, lowering the overall chemical contact for your little one. Enjoy the same benefits as conventional clothing. Organic baby clothes have all the same benefits of conventionally produced baby clothes. They are soft, absorbent when necessary and adorable. The only thing you miss out on when you choose organic baby clothes is potential harmful effects of chemicals used during processing. Less irritation. The chemicals and additives used in conventional baby products can cause irritation on your baby’s skin. It goes back to the sensitivity of the delicate skin. Some babies are more sensitive than others to the chemicals used during processing. Simply switching to organic clothes could help clear up ongoing irritation or rashes if the chemicals in conventional clothing are the cause. Better for the environment. Products produced organically are healthier for the environment. They reduce the amount of chemicals introduced into the environment. This includes the ground and immediate area where the products are grown, as well as the surrounding air and ground water since the chemicals wash away or blow away into the air. Employees of those organic companies also enjoy a healthier working environment since they are not exposed to dangerous chemicals. Increased availability. Not that long ago, organic clothes were difficult to find. As more people become aware of the benefits of organic clothing, however, these products are becoming more readily available. This gives you more selection and makes it easier to find the clothes you want. Cotton is one of the widest available organic fabrics. 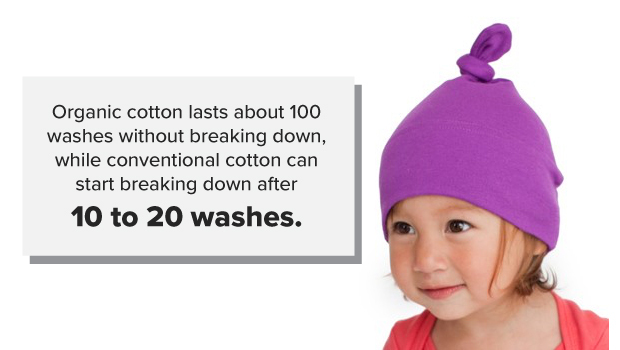 Cotton feels soft on your baby’s skin and is not likely to cause an allergic reaction. It’s durable for products like bibs and bedding, and it is absorbent in burp rags and other similar products. If you choose to go the cloth diaper route, cotton is often used to supply the absorbency — but cotton also comes with some dirty statistics. Cotton makes up about half of the fiber used in clothing and textiles, with 20 million tons produced worldwide each year. Cotton accounts for only 2.4 percent of crop land worldwide, but 24 percent of global insecticide sales and 11 percent of global pesticide sales are used on cotton. Based on the amount of cotton crop land, this crop is a heavy user of chemicals. All those chemicals have a major impact, both on you as the consumer and on the world as a whole. Grown without traditional pesticides. This means the end product is free of those chemicals. It also benefits the environment by eliminating pesticide runoff that can damage habitats and reach groundwater supplies. Organic cotton growers use techniques such as crop rotation and manual weed removal to protect the crops. Soft to the touch. Cotton is a comfortable fabric, perfect for clothing and bedding. Organic cotton does not lose any of that softness, so you can feel confident dressing your baby in organic cotton clothes. Increased durability. Organic cotton lasts about 100 washes without breaking down, while conventional cotton can start breaking down after 10 to 20 washes. That means you get more use out of organic cotton products — and we already established you’ll be doing a lot of laundry with a baby in the house. While you pay more upfront, the extended wear gives you a better value for your money over conventional cotton products. Diapers are another area of concern for many new parents. Cloth diapers made from organic cotton give you peace of mind if you’re concerned about chemicals in traditional diapers. If you don’t want to mess with organic cotton cloth diapers, many brands now offer organic disposable diapers or disposable diapers with fewer chemicals. Organic Baby Food: Is It Better? Your baby reached solid food stage. It’s a major milestone and an exciting time for you and your baby, but it brings up another question: Should I buy organic baby food? Like any other organic product, it’s a personal decision with some pros and cons to consider. Organic foods don’t contain dyes that are often found in conventional baby foods and snacks. Dyes offer no nutritional value and are often made from potentially harmful chemicals. Organic foods may use natural food products to add coloring without the harmful effects. You keep pesticides and other chemicals out of your baby’s body. Food goes directly into your baby’s body, so it stands to reason that food is an important area to go organic if you want to reduce their exposure to pesticides, herbicides and other chemicals. Your baby’s system is still developing, so offering pure, chemical-free food gives your baby the best foundation for proper development. Babies are often sensitive, and keeping potentially irritating ingredients out of food can help reduce irritation. Many people think organic foods taste better than conventional foods. While this is a personal preference, you may find you and your baby prefer the taste of organic foods. Cost: Organic baby food and formula typically costs more than their conventional counterparts. For families on a limited budget, that cost can be prohibitive. Not all organic food is highly priced, though. With greater demand for organic products, you can find many different brands at varying price points to help meet your budgetary needs. Sticking with the more affordable foods and brands helps you feed your baby organic food without blowing the budget. Limited options: While organic food is becoming more readily available than ever, conventional products still dominate the market. Some organic foods are limited to particular seasons, since they are grown without genetic modification and aren’t always grown year-round. Generally, though, you are able to find or make your own organic baby food products with enough variety to satisfy your baby. No nutritional difference: Organic foods may eliminate chemicals, but organic food does not provide any extra nutritional value. Your baby can get the same nutrients from conventional baby foods as they do from the same organic products. If cost is the main thing stopping you from choosing organic baby food, try making your own from organic fruits and vegetables. You can often find seasonal organic fruits and vegetables at reasonable prices, and making your own baby food isn’t difficult. Look for cheap organic vegetables at farmer’s markets or grow your own organic produce, so you know exactly what is used from seed to table. How Can You Be Certain Products Are Actually Organic? You’ve decided you want to buy organic, but how do you know you’re actually getting organic products? The best way is to stick to products labeled as “certified organic.” To earn that label, the product must meet rigorous standards from a third party, based on the materials and manufacturing processes. In the United States, the U.S. Department of Agriculture oversees organic certification. Not all cotton comes from the U.S., so other organizations handle organic certifications. SKAL is a Dutch organization that certifies cotton as organic. Look for “certified organic” on the label. This ensures the product meets the requirements of the certifying organization. Check the color. It seems strange, but the color can help determine if something is truly organic. Since organic dye options are limited, most organic cotton and clothing items won’t have a wide range of colors, and those colors won’t likely be bright, vivid colors. When you’re checking out organic foods, they shouldn’t contain dyes, unless those dyes are naturally derived from foods such as beets. Calculate the cost. As much as we all want a good deal, you’ll have to pay for organic products. 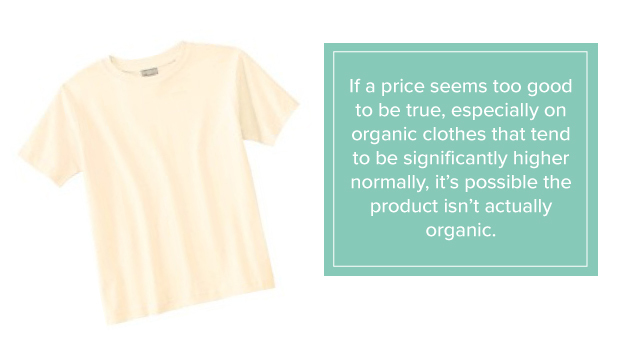 If a price seems too good to be true, especially on organic clothes that tend to be significantly higher normally, it’s possible the product isn’t actually organic. Find well-known organic brands. Do your research to find companies that produce quality organic products, and stick with those companies for your organic needs. Are you ready to join the organic baby movement? You don’t have to immediately change over to a completely organic lifestyle to make a healthy difference for your baby. Even changing a few things reduces the amount of chemicals your baby ingests or absorbs through their skin. Start taking small steps for a gradual shift by incorporating some organic items into your daily routine. At Cotton Creations, we can help you with your personal organic revolution. Check out our section of organic products to get started.